Afternoon tea is not just an occasional pleasure to me, it is a necessity! I enjoy giving teas and attending them and search them out wherever I go. 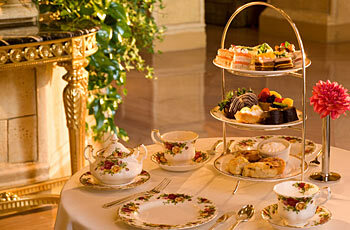 On a recent business trip to Los Angeles, I was a guest at afternoon tea at the Millennium Biltmore Hotel Los Angeles. Opened in 1923 in what is now downtown Los Angeles' cultural and financial district, the Biltmore is a designated Historical Cultural Landmark. The Old World architecture is nothing short of magnificent. Hand-painted vaulted ceilings, wood-paneled walls, elegant chandeliers, friezes, columns and carving everywhere. Ballroom with balconies, columned archways and rich brocade drapery. Afternoon tea is served in the Rendezvous Court, which once served as the hotel's main lobby. As if the carved wood ceilings, gold-leaf accents, Italian travertine stone walls and rose marble fountain were not enough, there is a magnificent double staircase overlooking the room. A grand space with soaring ceilings, it somehow manages to feel warm and cozy. Tea tables were covered in floor-length white tablecloths and set with Royal Albert Old Country Roses china accented by a yellow rose. The traditional three-tiered stand held an assortment of exquisite tiny diamond-shaped sandwiches, scones and homemade Devonshire-style cream, and an array of miniature pastries. Pots of excellent tea and glasses of sherry, kir or sparkling wine helped us leave the stresses of a hectic week behind. For reservations, call 213-612-1562. For tea at home, see: How to Make a Proper Cup of Tea, Tea and Scones, and my review of the Zojirushi Water Boiler and Warmer. Lovely! I've never done a formal afternoon tea. I'm going to have to add that to my list of "must-do" activities. By the way, my mom has those Old Country Rose dishes... I couldn't help but look at your photos and think of special occasions with my family. Jennifer, I'm so glad to hear you're going to do an afternoon tea! You're going to be hooked. And, fortunately, some of your friends will be too; so they'll start giving teas that you can attend instead of having to put on yourself! You make everything look and sound so good! I love your perspective on food, eating and life! Thank you! Oh Jean! This post just makes me ache to visit that place. How I'd love to see that building and enjoy tea and a plate with pretty little sandwiches and scones! I wish it weren't so very far from Wisconsin. Oh well. You described it so well that I could imagine being there. Thank you, Sue! Life is good. I like to really appreciate each moment. Judy, thank you! I'm so glad you liked it. You should try the Pfister Hotel in Milwaukee. What an elegant thing to enjoy! This looks like it was a lovely experience all around. Thanks for sharing, Jean! Thanks, Georgia. Yes, it was lovely! And, of course, I always dress for the occasion! Oh, how exquisite is afternoon tea! We should all do it more often. We need to preserve these bits of refinement in a crass world. Well said, Lana! There are lots of things we can do to preserve a bit of "civility"! Oh what fun - the Brit inside me loves the idea of afternoon tea, even though it's not often a practical idea with work and whatnot. It seems so nice and civilised to sit down with dainty little cakes and maybe some cucumber sandwiches, with the crusts cut away of course! Yes, Charles, I do so love being civilised! But the cucumber sandwiches I get out are never as good as the ones I make--hmm, maybe I should post them one day. Jean, how delightful. I love ANYTHING to do with tea. Even though I'm certainly not an expert by any stretch of the imagination. But I love the idea of tea in the afternoon. Tables filled with beautiful china, and little bites to eat........speak to my heart. Terri, thank you. They speak to my heart as well! 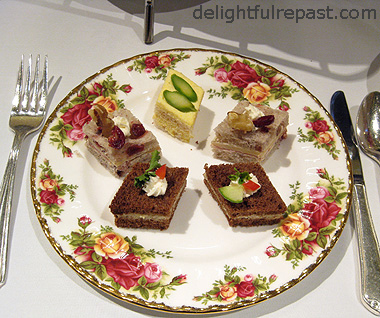 You'll find lots about tea at Delightful Repast as it's my favorite repast of the day.